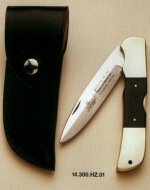 Our HUBERTUS manufacturing program comprises different classic and modern types of pocket knives. This section is still under construction and will be completed soon. 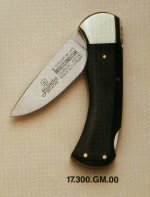 HUBERTUS Pocket Knife Series "14"
Besides our classic large hunting knives we manufacture two knife models in similar size in the series "14". These knives are characterised by a locking blade with a modern shape. The release of the blade is carried out in a traditional way by a pusher on the back of the blade. HUBERTUS Pocket Knife Series "15"
Our pocket knife series „15“ is characterised by a modern blade shape with a drop-point blade. 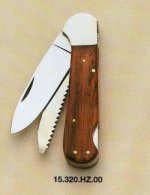 Therefore it represents an alternative to our classic hunting knives. The release of the locked blade is carried out in a traditional way by a pusher on the back of the blade. Handle length: 11 cm / 4.33"
Overall length with opened blade: 19.5 cm / 7.68"
HUBERTUS Pocket Knife Series "16"
Our modern pocket knife series „16” is characterised by a very slim handle. The underside of the handle is featured with two waivy grabsteps. Additionally the blade is designed in a clip-point shape. Handle length: 10.5 cm / 4.13"
Overall length with opened blade: 18.5 cm / 7.28"
HUBERTUS Pocket Knife Series "17"
Our compact pocket knife series „17“ is characterised by a grabstep with maximum grip making the transition between handle and blade very safe. 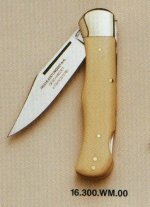 Overall length opened: 18 cm / 7.09"
Our pocket knife series „73“ is a variation of the classic Swiss army style multi-bladed pocket knife produced by the company Wester & Co from Solingen. This company doesn't exist nowadays. 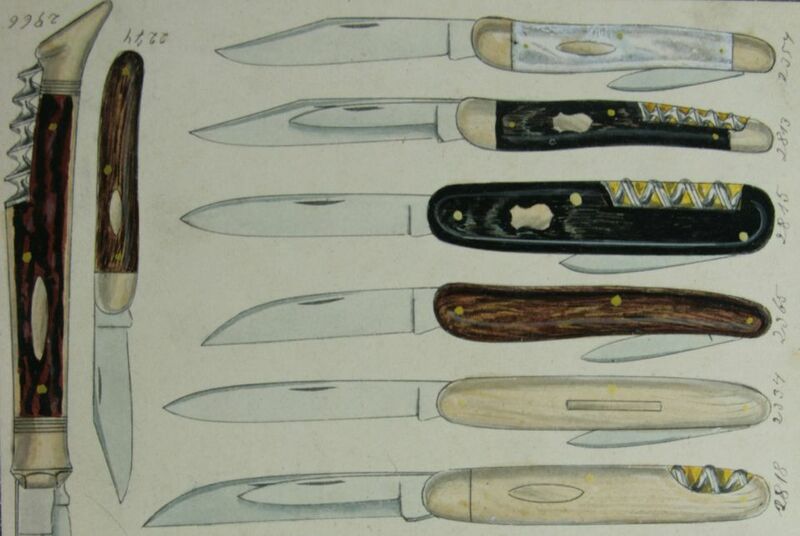 At first Wester & Co delivered the Swiss army with these knives. Later the Swiss department on war ordered these knives under the term "Soldatenmesser Modell 1890" ("soldier's knife model 1890") from different companies in Solingen. 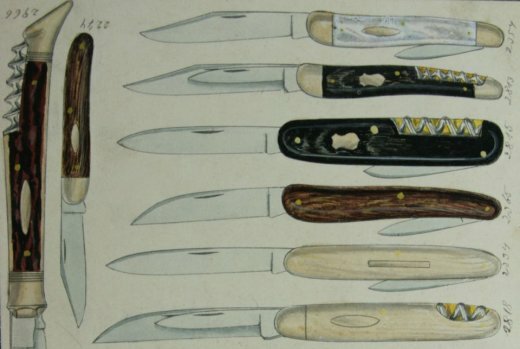 hand-drawn, colored illustrations of pocket knives in a pattern book of an unknown company.